Everytime J looks at a mattress on the street she sees this image. The photo appeared in Saturday’s Age. The title of the article was Torture 21st Century Inquisitors. There was no reference made to the photo in the story, no title and no credit. 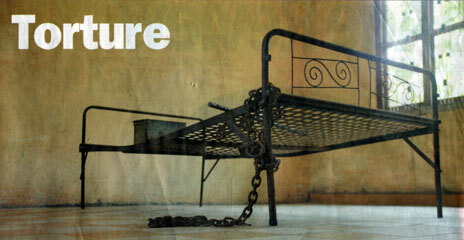 J recognized it immediately; anybody who has been to Cambodia’s Genocide Museum in Phnom Penh can never forget that bed. No mattress, no body, no compassion. I’ve seen this exact bed in Phenom Pehn in Cambodia when I was ther a few months ago and it has stuck with me ever since. Yes, me too. I visited in 97 and it’s still etched into my brain.